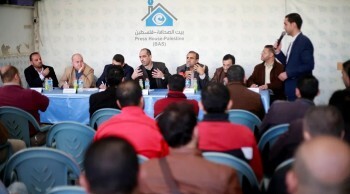 Journalistic bodies, Media and Human Rights Institutions and Journalists Syndicate held a meeting on Tuesday,12th Feb,2019 at the headquarter of Press House - Palestine to discuss the decision of the governmental media office for the issuance of a Press Card for the journalists in Gaza Strip. 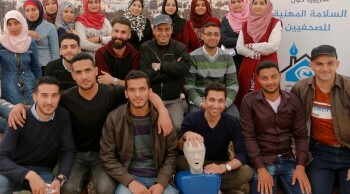 The Governmental Media Office in Gaza declared on 10 February that after 1/4/2019, no journalist will be allowed to conduct press interviews or any media work within government ministries or institutions until presenting the Press Card issued by the Ministry of Information. During the meeting, the participants discussed the legality and proficiency of the governmental media decision, and seek lobbying mechanisms to stop this action. The participants expressed their rejection of the Governmental media office decision to prevent journalists from reaching official and governmental institutions and departments, except by special card issued by them. They emphasized that the decision of the governmental media office is incompatible with the right of access to information and the freedom of journalism. 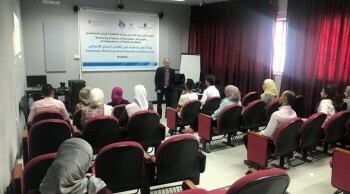 After the meeting, Dr. Tahsin al-Astal , Deputy Chairman of the Palestinian Journalists Syndicate, said that the imposition of new conditions on journalists will narrow down Media institutions work , stressing that the Journalists Syndicate is the authorized body to organize the journalistic work. Dr. Al-Astal confirmed that the Syndicate's card is the recognized card among journalists, to know their identifications among media institutions and officials. He pointed out that the requirement that the journalist obtain the card of the Ministry of Information is an additional restriction on the work of journalists. 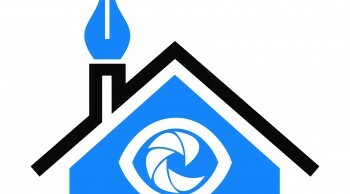 The Deputy Chairman of the Journalists Syndicate pointed out the role of Ministry of Information in organizing the institutional work of Media institutions, not in organizing the journalistic work and the entry procedures of journalists, nor their work and performance of their lofty mission in the national work. 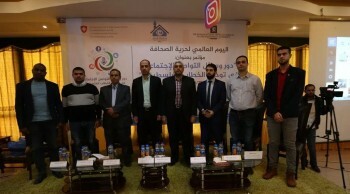 For his part, the head of the Palestinian Journalist Group Ahmed Zoghbor said that the action taken by the governmental media office in Gaza to Reactivate the Press Card of the Ministry of Information for journalists in the Gaza Strip is an administrative process to organize the journalistic work inside governmental institutions. whcih is far from any means of fears or any oppressive cases. Zoghbor called on the governmental Media office to reformulate its declaration to prevent journalists from entering government institutions unless they obtain this card. At the same time, he stressed that Palestinian Journalism have its full freedom to work in all institutions and to continue its mission to serve the Palestinian society. This in turn, Wissam Zoghbor, a member of the Democratic Media Gathering, said the decision was rejected because it restricts Palestinian journalists work noting that it’s more appropriate to establish procedures that would facilitate journalists work to perform their journalistic duties with ease. Zoghbor said the decision had been rejected because it was issued by the governmental Media office, whose task is to organize the work of governmental institutions and not restrict the Palestinian journalism. For his part, Rami Al-Sharafi, the official of the Democratic Media Gathering, said that this decision contradicts the right of access to information and the freedom of journalism. It contravenes the text of the Palestinian Basic Law in its Article 19 and in same article number set out in the Universal Declaration of Human Rights, as well as the International Covenant on Civil and Political Rights . Al-Sharafi Added ,"What are the criteria for obtaining the card and why they are issued by the Government media office and not by the journalists' Syndicate, who could in a previous time issued them special cards for their membership ”. He also called on the Government Media Office to reverse its decision and to work on following other mechanisms to reformulate the work of media in official institutions, without any restriction on the freedom of journalists and their right to access information from its sources and from the governmental institutions, stressing that this can be done through communications with Journalist’s Syndicate and Press frameworks, to discuss this issue. In the Participation of Syndicate and Journalistic Bodies.. Press House Hosts a Meeting for Discussing Al-Ketab Channel Crisis.